Emma was surrendered to us together with her son Jasper and a mammoth donkey named Traveler in January 2016. Traveler found a home in Moriarty, and Emma and Jasper went to a home in Silver City. But their adopters developed some serious health issues not long thereafter, and Emma and Jasper were returned to us that summer. While Jasper moved on to a new home in December 2016, Emma stayed on and tried out several foster homes, almost landing another adoption in Galisteo. Eventually she found her perfect home together with two older geldings, and she continues to be a very happy old lady. Emma was officially adopted on February 23, 2019. Valentine is a former BLM burro from Arizona, one of the many who are adopted out by the BLM and somehow eventually find their way to us. His original name was Vader. He came to us as an owner surrender in May 2017. At the time he was still a castrated jack. He hadn't been with other donkeys for most of his life, and so he immensely enjoyed the donkey company at our foster homes. He was castrated in August 2017. After moving around a little trying out various foster homes and coming close to being adopted twice, he finally found his perfect home in Edgewood, together with his girlfriend Emma and another gelding named Blue with whom he loves to play and sometimes has some minor quarrels. Valentine was officially adopted on February 23, 2019. Walker Bue, also called Blue, originally joined our cattle donkey adoption program in 2012. He was shipped from Texas, his home state, directly to a cattle ranch in Quemado to help guard the calves there. 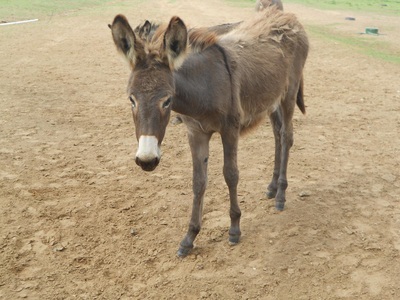 But he soon proved to be deficient as a guard donkey, chasing around the young calves instead of protecting them. So he entered our rehab and adoption program that summer and was adopted out to a home in Sandia Park together with a younger gelding. He stayed there for 6 years, while his buddy died in the middle of that period, leaving Blue alone with some goats and his elderly adopters. Eventually, Blue was returned to us when a hungry and ravaging bear terrorized his neighborhood, killing one of the goats that were his companions at the time. Blue stayed with us for about half a year, making friends among the donkeys, until he finally found his perfect adoption situation. He now shares a nice pen with shelter and a large pasture with Emma and Valentine. He was officially adopted on February 23, 2019. Minnie and Pearl are a mother-daughter team that came to us on November 11, 2018, to find a new home through our adoption program. Fortunately, we already had the right home lined up for them. They stayed with us through much of the winter and enjoyed the vast spaces of their foster home in Cedar Grove, occasionally going on hikes and learning (or unlearning) a few things as needed. They left us for their new home in La Madera on January 31, 2019, and seem to be quite happy there. Marcela and Ascienta are originally from Texas and first entered our cattle donkey adoption program in 2012. 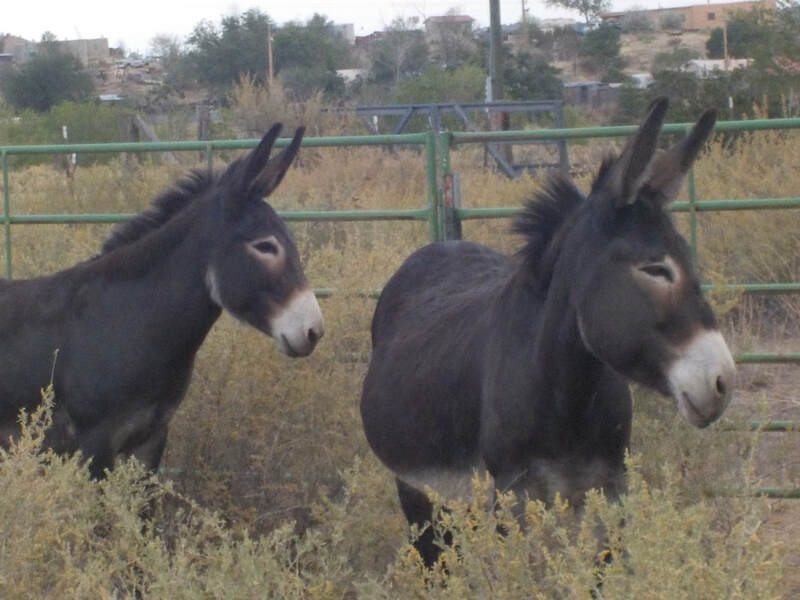 They spent 5 years as cattle guardians on a large ranch in Quemado, until a new ranch manager decided that donkeys were not the most efficient way to guard their little calves from predators such as coyotes. They were 'returned' to us in late summer 2017 together with 12 other donkeys. Due to Marcela's special trust issues, they as a bonded pair took longer than most of the others to become ready for adoption. But eventually they got to a point where they could be moved on for adoption to the right family. And we think the right family came along. They left us for their new home in Tome, NM, on October 20, 2018. 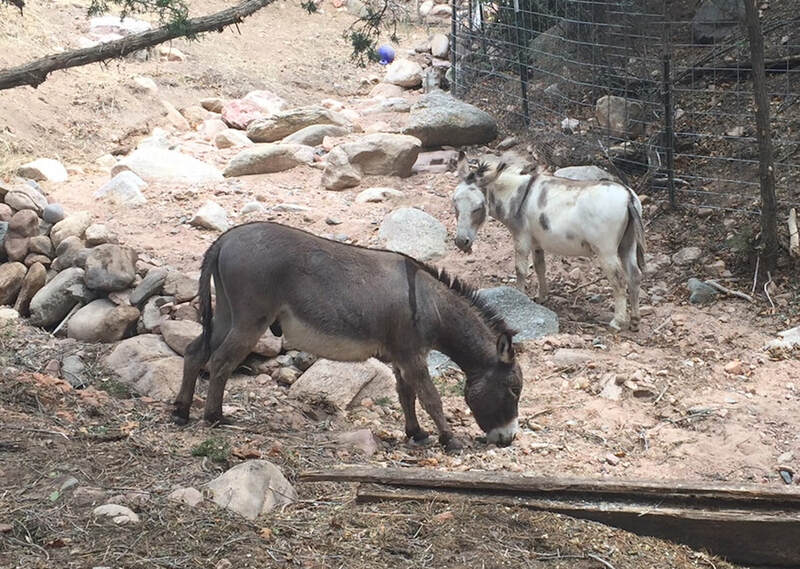 Daisy and Meena are two mini donkey jennets who came to us from Chaparral near the Mexican border in late May, 2018. After a summer of fostering and some readjustment training, they found a lovely and idyllic new home through us in La Cienega, Santa Fe. They left us on September 9, 2018. 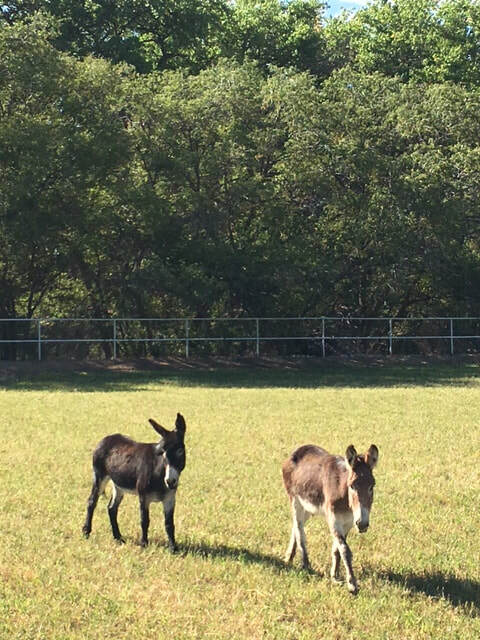 Benito and Luigi (formerly Timmy and Hank) are two mini donkey geldings, father and son, who came to us from Chaparral in early June, 2018. They found an exciting new home through us in Tesuque, Santa Fe, and now enjoy living in an arroyo and going on hikes with their people. They left us in late June 2018. Bette and Cher came to us from Chaparral, NM, in early June, 2018. After spending some time in foster care, they found a new home through us in the San Pedro neighborhood outside of Edgewood, NM, and left us on June 27, 2018. The two jennets were lucky enough to be able to stay together as mother and daughter. They are now sharing their space with Chrissy and Debbie, another 2 jennets that we adopted out the previous year, and a bunch of ducks. Debbie (formerly Darla) and Chrissie (formerly Spirit) are two of the 14 former cattle guardian donkeys from TX that were under contract with us and eventually moved into our care in the summer of 2017. 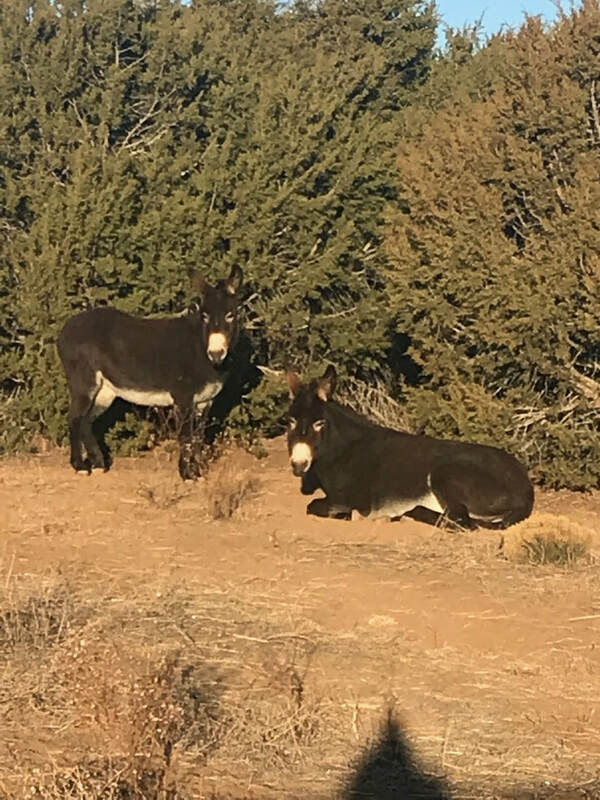 After receiving their ground training (they were pretty much undomesticated), they found a loving home in Sandia Park and left us on November 17th, 2017. They are getting a lot of loving and attention at their new place. Marley and Rosie, a team of mother and son, came to us in early August 2017 after their owners reached out to find them a new safe home. Their dogs had gone after the donkeys, and Marley had a lot of bites and scratches. It turned out that he also had a respiratory infection, and both donkeys were thin and hadn't been wormed in a long time. They recovered very well here, and Rosie also received some more training to stand better for the farrier. They put on weight and eventually were ready for adoption. They found a new home in Albuquerque's South Valley, and their new adopters are very excited about having them. They will be taking them out on the trails to go hiking. Though Rosie is a former roping donkey, both donkeys are very good-natured and sweet and will be very happy to do things with their people. Rosie and Marley left is for their new home on September 16, 2017. 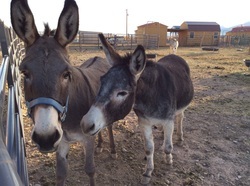 Prudence and Bridget are two jennets originally from TX who were placed in our cattle donkey adoption program to go to a ranch in Western NM to guard the calves there. For almost 6 years they had a bunch of cattle as well as other donkeys as company, vast open spaces, but little interaction with humans. They were returned to us in the summer of 2017 together with the remaining 12 other cattle donkeys at the ranch. After a couple of months training they were adopted to a nice home in Sandia Park on September 2, 2017, where their training will be continued. At first a bit shy, they both started learning very quickly and really enjoy doing things with people. At their new home they will become pack and hiking donkeys. We wish them all the best. 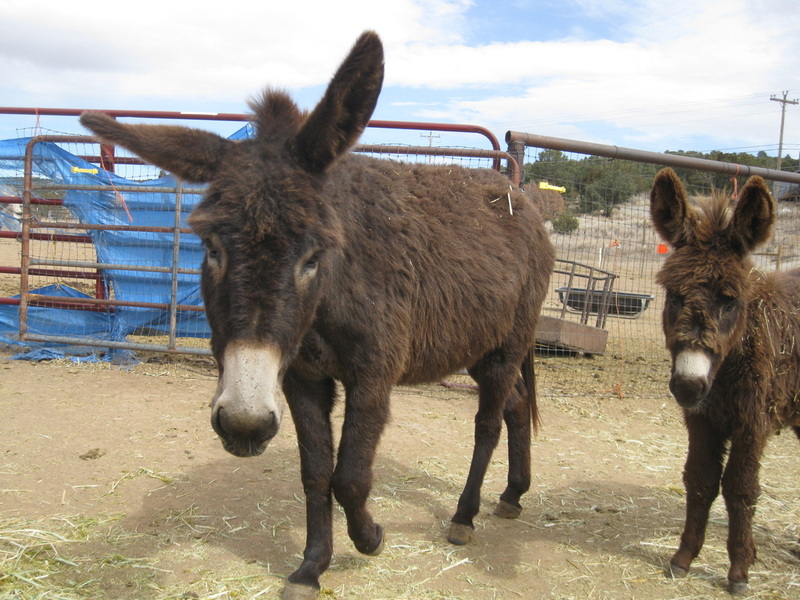 Thelma and Louise are a very bonded mother-daughter pair that worked in our cattle donkeys program at a ranch in Western NM. Thelma (formerly Spot) was originally from TX and was rescued in early 2012 from slaughter or other undesirable futures in collaboration with a TX rescue. We first arranged for her, together with 20 others, to be adopted by a large cattle ranch in NM, with backing through our rescue. There Louise (formerly Tango) was born in early December 2012. They were given the job of guarding cattle herds against predators such as coyotes while the calves were growing up. This cattle donkey program committed us to taking them in and finding them a new home if the ranch no longer wanted them at any time. Over the years, we took in two small groups of these donkeys. Then, a little more than 5 years later, we were unexpectedly notified that the new ranch manager no longer wanted donkeys as guard animals. 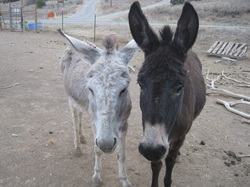 ​Thelma and Louise were among 14 cattle donkeys still at the ranch at the time. They arrived in our care on July 9, 2017, to be trained and find a new home. Due to their friendliness and quickness of learning they did not have to wait for long. They were adopted to a nice place in Tijeras and left us on August 14, 2017. Their new life will be exciting compared to the life they used to have out on the range, and they will make their adopters very happy. Jessie and Raven are two bonded jennets originally from TX that we rescued in 2012 from slaughter or other undesirable futures in collaboration with a TX rescue. We first arranged for them, together with 20 others, to be adopted by a large cattle ranch in Western NM, with backing through our rescue. There they were given the job of guarding cattle herds against predators such as coyotes while the calves were growing up. This cattle donkey program committed us to taking them in and finding them a new home if the ranch no longer wanted them at any time. 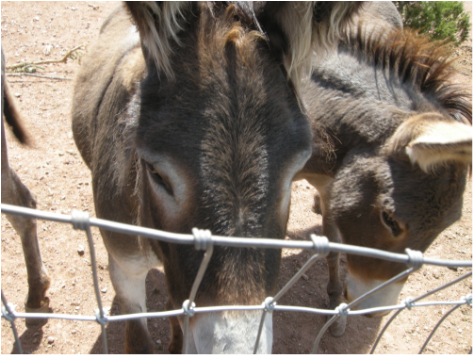 Over the years, we took in two small groups of these donkeys. Then, a little more than 5 years later, we were unexpectedly notified that the new ranch manager no longer wanted donkeys as guard animals. 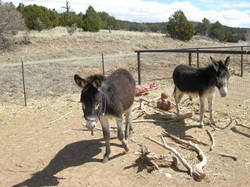 Jessie and Raven were among 14 cattle donkeys still at the ranch at the time. They arrived in our care on July 9, 2017, to be trained and find a new home. Due to their friendliness and quickness of learning they did not have to wait for long. They were adopted by a horse farm in Santa Fe and left us on July 29, 2017. Their new life will be luxurious compared to the life they used to have out on the range. We are very happy for these two bright jennets! Jasper is a friendly large standard gelding who came from the same home as Traveler. 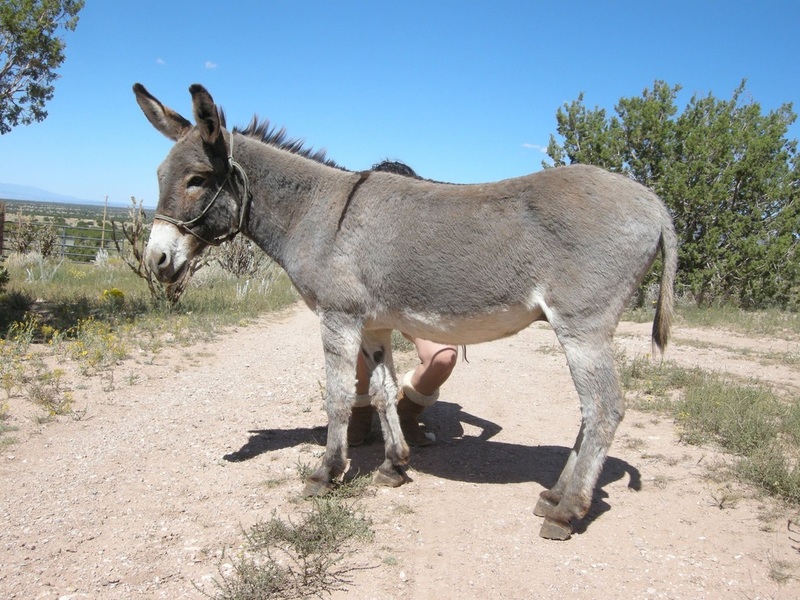 He found a new home as a companion to another donkey in Springer, NM. He left us on December 26, 2016. 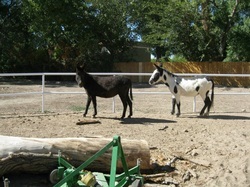 He is enjoying the vast spaces and wildlife at his new home and plays rough donkey games with his new buddy. Missy and Cocomo originally came to us in the summer of 2013 as an owner surrender, together with Missy's adult son Hotay. Hotay was adopted out separately not long afterwards, but Missy and Cocomo stayed together. They were first adopted out to a home in Belen in the spring of 2015, but that arrangement did not last beyond a year due to circumstances beyond their control. We then found a new forever home for them with a family in Tijeras, where they are given the freedom to roam several acres of pasture around the house. They left for their second adoptive home on August 28, 2016. Luke and Bilbo came to us as intact jacks on different dates in 2013. 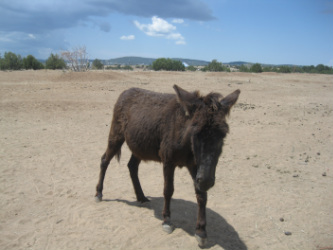 Luke was one of 17 feral donkeys culled from the Navajo reservation that managed to escape the fate of slaughter. Bilbo, his jennet, and their foal were also feral and lived on a large private ranch property, where they were captured by BLM employees and brought to us rather than to the sale barn. We paired up Bilbo and Luke, since they had similar backgrounds. In the course of time, they grew very fond of each other and are closely bonded now. They were both gelded through us and received basic handling and halter training. They were first adopted out together to a home in Sandia Park in early 2014, which lasted about 2 years. We then found another adoptive home for them in Golden, where they moved to on February 28, 2016. They are now roaming 20 acres of land and having a great time together. In a way they managed to get back to the freestyle life that they were used to, but they also maintain good relations with the humans who feed and care for them. Traveler is an 18-year-old mammoth donkey gelding whose elderly owner contacted us to find a new home for him and his two buddies. He was riding and driving trained and just hadn't had any practice in a while. We found a great home for him in Moriarty, where he now has some big molly mule friends and gets to do some light work. He on January 31, 2016, and by all accounts has remained a happy camper ever since. 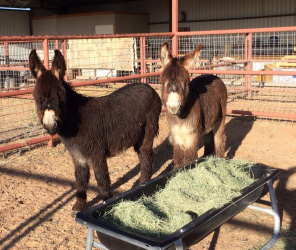 Tessa and Orchid (right) belonged to a herd of 17 feral Navajo donkeys that a trader brought to us in April 2013 after they had been rejected at the sale barn, since at the time they would not have been profitable on the meat market. Not knowing what to do with them he placed them with us. The two closely bonded jennets, themselves most likely mother and daughter, were pregnant at the time and gave birth to a jack and a jenny foal, respectively, in August and September 2013. Tessa and Orchid received basic ground training here and became very friendly donkeys. 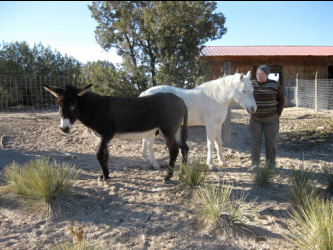 They finally moved on to a new forever home near Las Vegas on October 17, 2015, to keep a lonely donkey gelding (left in the picture) company. Sweet Pea came to us as an owner surrender in June 2015. Her owners had rescued her from another situation, but they had not been able to teach her to trust them, and so she had remained very timid and elusive at their place. In addition, she had not been with other donkeys for most of her life. So she was placed with a group of our donkeys for a while until she had learned the necessary social skills that go with being a donkey. And then a new home opened up for her to become a companion to another lonely jenny who had just lost her long-time companion a few days earlier. So Sweet Pea moved on to a new home in Moriarty on August 23, 2015, and has been very happy there ever since. Pearl and Wyatt came from very different backgrounds but ended up being adopted out together to a home in Santa Fe on August 3, 2015. 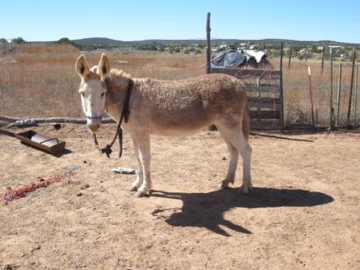 Pearl came to us together with her mother, and old BLM burro, from a home in Alamogordo in early July 2012. The two bonded jennets were already well domesticated and easy to handle. Daisy, her mother, had to be sadly put down several years later in connection with an uterus tumor that she had developed. Pearl and Wyatt are getting along very well at their new home. Update: Sadly, Pearl had to be put down at her adopter's home on September 9, 2018, due to advanced laminitis. Wyatt returned to us after Pearl's demise and may be looking for a new home at some point. Creosote and Lily Marlene were two bonded senior donkeys in Colorado whose owner was trying to find them a safe home as her health was failing. Since the local donkey shelter in Colorado was unable to take them, a friend of the owner turned to us. 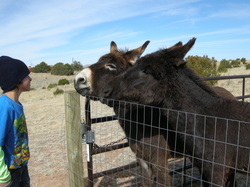 It took us a little while, but we found a good home for them at a private donkey sanctuary in southwestern NM. They arrived there on July 23, 2015, and have been happy ever since. 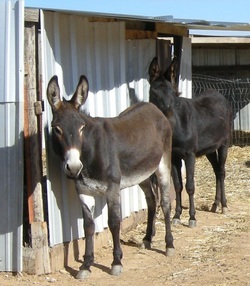 Billy and Pete were among a herd of 21 donkeys that we rescued on November 8, 2011, from Southwest Livestock Auction. They were neglected with long, crooked feet, very overweight (Billy looked like a pregnant jennet), and obviously traumatized by people. After about 6 months in a calm, loving environment they were adopted out for the first time to a home in Madrid, where they spent 2 happy years. They were returned to us due to financial hardship and spent another 6 months in Golden, until they found a new loving home with goats, sheep, a toddler and a horse in Cedar Crest. They're learning to pack and regularly go on hikes with their new people. After a trial period to see how they would get along as guardians for the other livestock they were officially adopted on May 27, 2015. Lunita was a middle-aged friendly jenny who arrived rather thin and with some lice problems but overcame these health issues over time. She arrived with her mother Panchita, who was eventually adopted out separately. After her mother left Lunita started developing more individual personality and to show more energy as well. She bonded with a young jenny named Sofia, and the two of them were adopted by their foster person in La Puebla, NM, who fell in love with them. Sofia (formerly Faith) is originally from Texas and entered our cattle donkey adoption program in March 2012, when she was adopted out through us to a ranch in Quemado, NM, to guard the young calves there. Since the ranch was downsizing its donkey herd, Sofia was sent on to us together with Valentina and Chico in March 2014 to obtain some training and handling and get ready for a new adoptive home. In October 2014 Sofia went to a foster home in La Puebla, NM, together with Lunita, and the two of them were eventually adopted by their foster person on January 18, 2015. 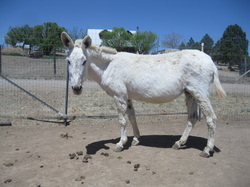 Roxanne was rescued from the Los Lunas sale barn in October 2011. 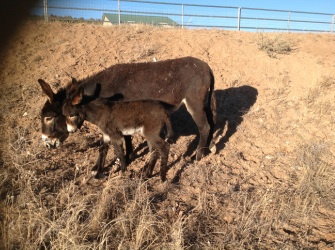 Heavily pregnant at the time she gave birth to a jenny foal (Cinca) on October 23, 2011, and the two girls were adopted out from a foster home in Bernardo, NM, to a home with 36 acres in Capitan, NM. They spent 2 years at their new home, roaming all the 36 acres with another two jennies and their offspring, until the family had to return the donkeys to the care of TLS due to family issues. Roxanne, Cinca and their companions went to a foster home in Moriarty, NM, and have since been learning to become more domesticated. Roxanne is a tall, sturdy standard donkey roughly 6 or 7 years old and very friendly. She was adopted as a horse companion by a very nice lady in Alamogordo and left us on December 3, 2014. Liberty (formerly Cinca) was born on October 23, 2011, to Roxanne, a jenny rescued from the Los Lunas sale barn, just shortly prior to the event. She was adopted out together with her mother to a home in Capitan, and the two jennies received more company about 4 months later, when they were joined by another two mothers and their offspring. 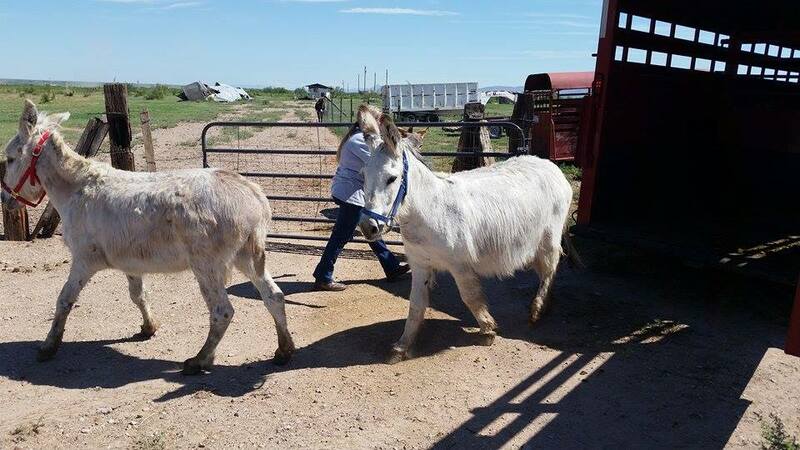 Roaming the 36 acres of their new home, the donkeys did not receive much handling. Thus, when they were returned in early summer 2014 to the care of TLS they had to adjust to domesticated life in ways they had not been used to before. Liberty and her mother spent almost 6 months at a foster home in Moriarty until Liberty was adopted as a companion for a young jenny in MacIntosh, NM, whose name is Justice. She left us on November 25, 2014. 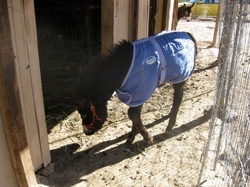 Raymond was rescued from the Los Lunas sale barn and feedlot on October 24, 2011. 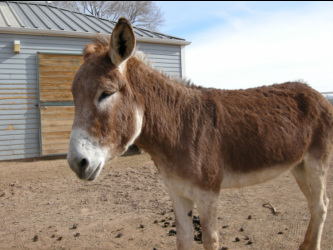 He was a very large standard, almost mammoth sized donkey (most likely having at least one mammoth donkey for a parent) probably disposed of at the sale barn by an irresponsible breeder because he did not meet size standards. Raymond was first adopted as a personal donkey by Andrew Cross and Dorothea Lotter, TLS's founders, in 2011 and spent three years as a pet donkey in a herd together with four other big geldings. In Fall 2014 it was decided that he should move on to a new situation were he could receive more one-on-one attention and training. He was adopted out to a new home in Colorado through TLS. Raymond left us on October 25, 2014, almost to the day three years after his rescue and is very happy at his new home. 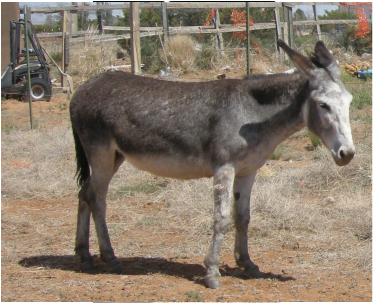 Champagne was a former roping donkey whom we rescued in November 2011 from the Los Lunas sale barn together with 20 other donkeys. 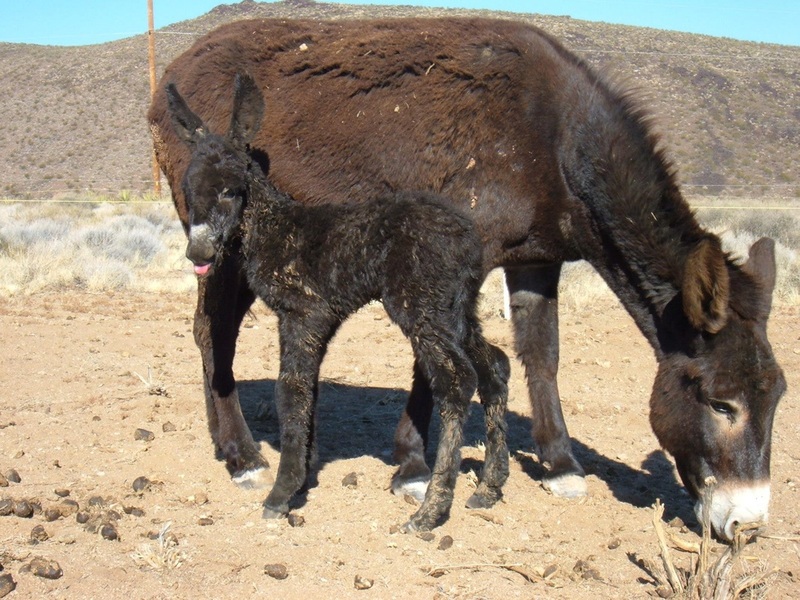 She gave birth to a jenny foal named Sparkle in January 2012 and was adopted out to a home in Capitan together with Sparkle and four other donkeys. 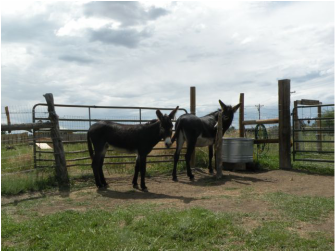 Due to family hardships the donkeys were returned in early summer 2014 and accommodated at a foster home in Moriarty, NM. Champagne was always very skittish, but she is gradually warming up to people. 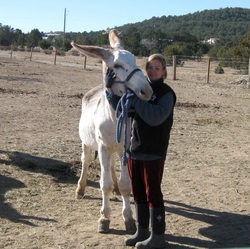 She left us for her new home in La Puebla, NM, on October 25, 2014, and is keeping a lonely donkey gelding company who was very excited to see her. She also has some old friends nearby that are being fostered. 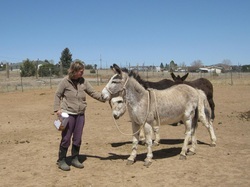 Sierra was another one of the donkeys who were rescued from the Los Lunas sale barn on November 8, 2011. She gave birth to a jack foal we named Suncatcher on February 9, 2012, and was first adopted out together with her son as well as her friend Champagne and her daughter Sparkle to a home in Capitan in early 2012. 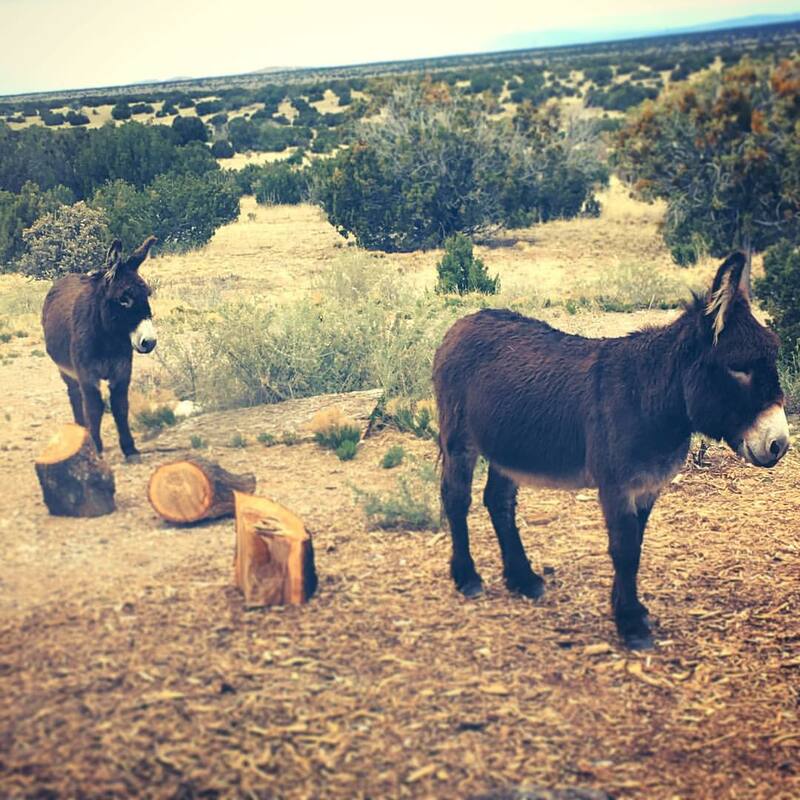 From there the donkeys were returned in early summer 2014 due to family hardships and fostered in Moriarty, NM. Sierra found a wonderful loving home in Santa Fe, NM, and left us on October 5, 2014. She is keeping a lonely mustang mare company and is being spoiled by her human. 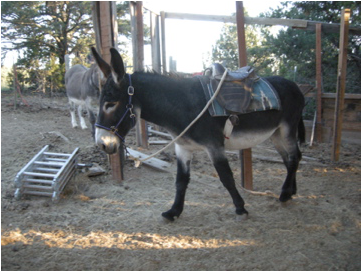 Lonnie, an older former BLM burro gelding, was an owner surrender who arrived at TLS on July 22, 2013, from a home in Mountainair, NM. He had a bad lice infestation and was skinny. After several months of treatment and good food he looked pretty healthy again and had become a perky, loving old guy. He was briefly adopted to a nearby home on December 28, 2013, but returned to foster care on April 9, 2014. Lonnie left us on October 5, 2014, to go to a permanent foster home near Los Cerrillos, NM. Though he has not been adopted by his new people but remains on TLS's feed list, this is a permanent situation that we wholeheartedly support, since it is in his best interest. Thus he is no longer available for adoption as long as his current situation remains in place. 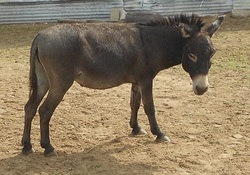 Valentina (formerly LaaLaa) was originally sent to us by a Texas rescue that was having troubles placing their donkeys. She first came to us in December 2012 and was adopted out the same months as a cattle donkey to a ranch in Quemado, NM. 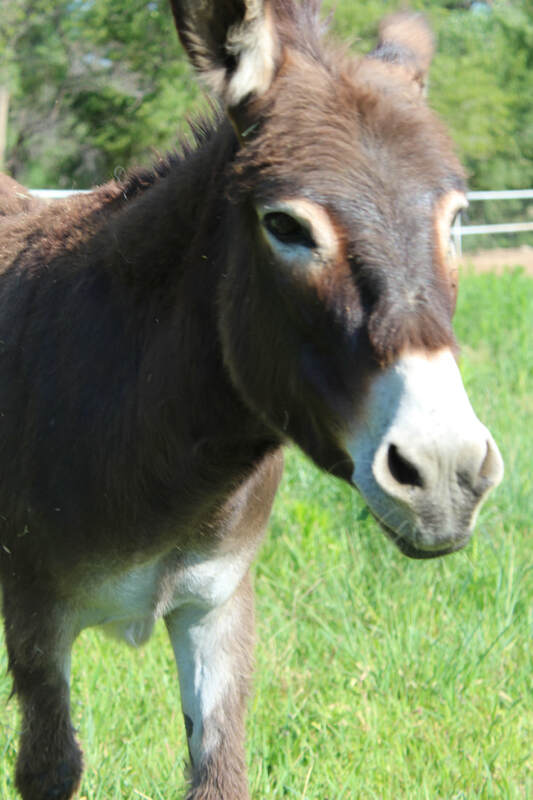 Since the ranch was downsizing its donkey herd, Valentina was returned to us in March 2014. She arrived with a little jack foal by her side that we named Chico and later adopted out to a home in Algodones. Valentina learned to accept a halter and lead a little, and she became very friendly with people. Eventually she was picked as a companion to Percy, and the two of them left us on September 19, 2014, to a great home in Grants, NM. Percy came to us in November 2013 with a very bad case of clubfoot on the entire left side. While his left rear could be corrected just by means of trimming, his let front was a different matter. Our very experienced farrier said that this may have been the worst clubfoot he had ever seen. Percy underwent surgery on May 22 and received a corrective shoe with a beak in the front that forced him to walk properly. Within 3 months his foot was corrected, and he retained just a slight limp. We hope that this limp will also go away over time. Percy left us on September 19, 2014, together with Valentina. The two went to a wonderful home in Grants, NM. Simon (formerly Seamus) first came to us in April 2012, at which point his name was still Seamus. He had been with another rescue and was adopted out several times, never really finding a really loving home, it seemed. We adopted him out to a friend shortly after his arrival, where he stayed for 2 years until he came back to us. We placed him in foster care for a few months in Golden, NM, where he joined a mixed herd of horses and donkeys. Since he clearly liked horses better than donkeys we found him another home as a horse companion, and he left us on September 18, 2014, for his new home in Eldorado, NM. Panchita, an older jenny, came to us together with her daughter Lunita in January 2014 after their owners had asked us to take them in and find them a good home, since due to health issues they could no longer care for them. Though initially very bonded the two jennies had great un meeting new donkeys and actually grew a little apart over time. This is why we decided that they could be adopted out separately. Panchita now resides in the South Valley of Albuquerque keeping two other jennies company. Se left us on September 14, 2014. LeeLee came to us from a rescue in Texas in early December 2012 and was adopted out together with her mother LaaLaa and an older gelding named Joe to a cattle ranch in Quemado later that month. 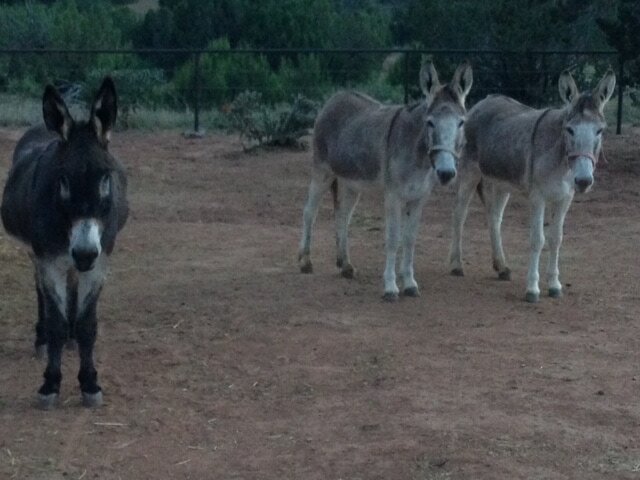 The donkeys were working at that ranch as guards for the young calves. Since the ranch was downsizing its cattle and donkey herd, LeeLee was sent back to us together with two other cattle donkeys in January 2014. Since then she has been in boarding and training at a foster home on the Turquoise Trail and is learning to accept a halter. LeeLee and her friend Zoe were officially adopted by their foster mum on July 19. 2014. 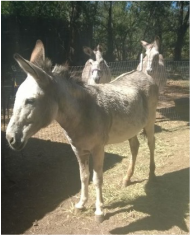 Zoe (formerly Catherine) was another cattle donkey from TX who entered our cattle donkey adoption program and was adopted directly from TX to a large cattle ranch in Quemado, NM, to protect the young calves from coyotes and other predators. However, the ranch found that it needed to downsize its cattle and donkey herd, and so Zoe was sent on to us together with two other donkeys in January 2014. Since then Zoe has been in a foster/boarding situation about 30 minutes from our location and is learning to accept a halter and to lead. She likes people but is still undergoing basic training. Zoe, who is about 6 years old at this time, has entered a foster-to-adopt arrangement together with her friend LeeLee. The two girls were officially adopted by their foster mom on July 19, 2014. Indie (formerly Chico) was Valentina's jack foal and was born in Quemado on September 21, 2013. 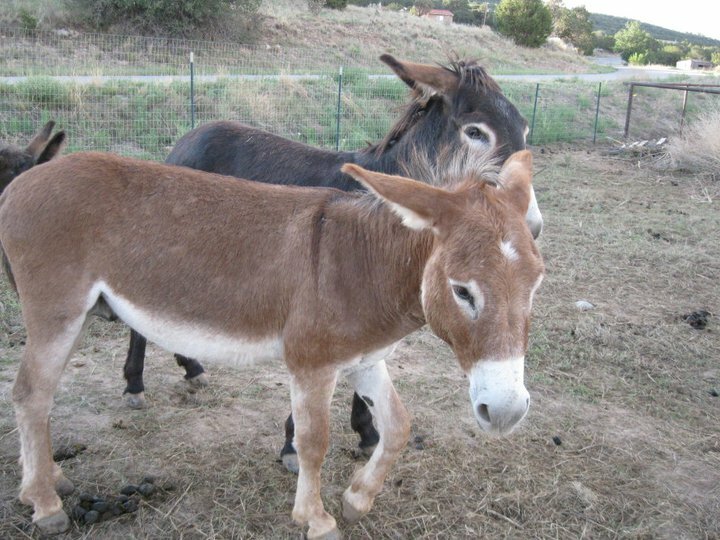 He was thought to be a jenny at first and was named Cha-Cha; after several months it was noticed that he was a jack, and the ranch in Quemado did not want any more male guard donkeys. So Chico was sent to us together with his mother. At TLS he learned to be haltered, tied and led. He was gelded on July 9, 2014, and left us on July 19, 2014, to a great home in Algodones to become companion to another gelding donkey. Carla and Ariel were a mother-daughter team from TX who first came here in late February 2013. Ariel was born in TX on September 21, 2012. Her mother Carla was about 4 years old when they arrived here. 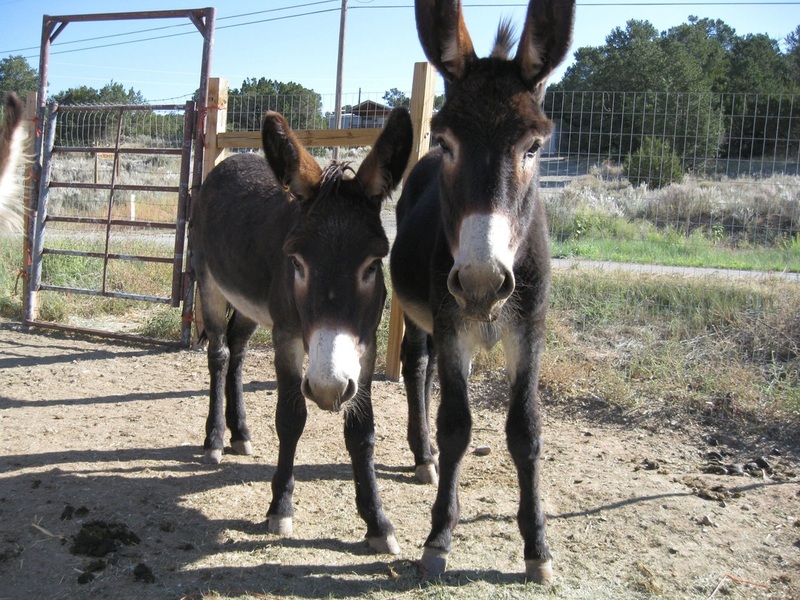 They were first adopted out to a home in Los Lunas in May 2013 but returned to us on March 23, 2014. At that home they were comfortable but did not learn very much about domestic life. Back at the Safehouse they underwent some more basic training to make them comfortable with being handled by people, and with tools such as halters, lead ropes, brushes and other things. 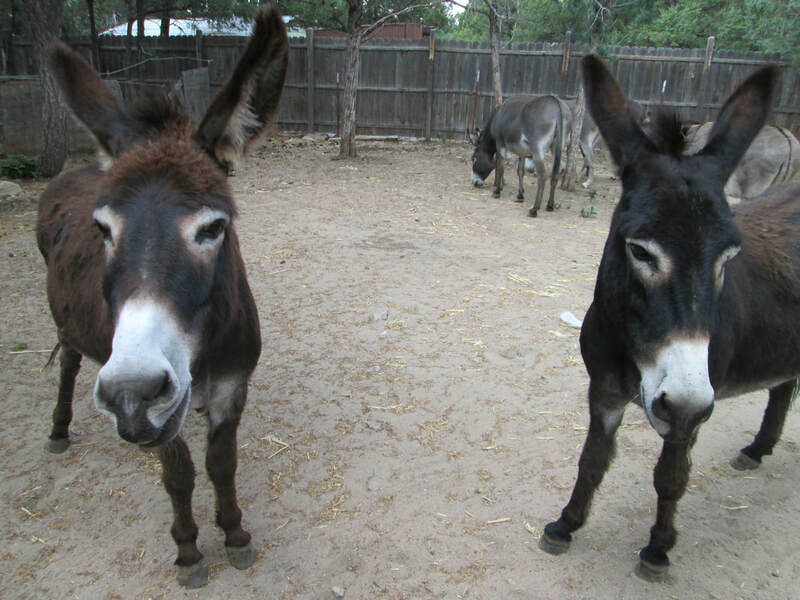 Carla and Ariel were eventually adopted at a ranch in Tierra Amarilla, NM, to be further trained as guard and pack donkeys. They left us on June 18, 2014. Cisco and Sadie (formerly Moonracer and Merlina) were two half-siblings born at our facility in late summer 2013. Merlina, the black jenny foal, was born on September 4, 2013, and Moonracer, the cinnamon/gray colored little gelding, was born on August 20, 2013. 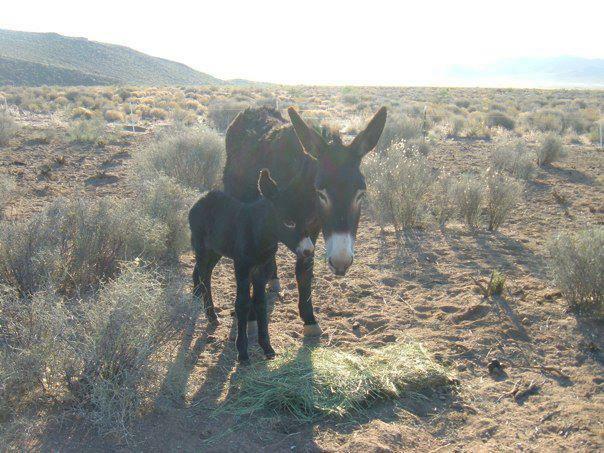 Their mothers Orchid and Tessa are two closely bonded members of a herd of 17 wild Navajo burros surrendered to us by a contractor of the Navajo Nation on April 11, 2013. The two foals have always been together, and young Moonracer was present when Merlina was born, We are very happy to have found them a wonderful forever home together as well. The two, who left us on May 1, 2014, live off NM 14 just south of Santa Fe. They seem very happy at their new home and enjoy lots of love and attention! 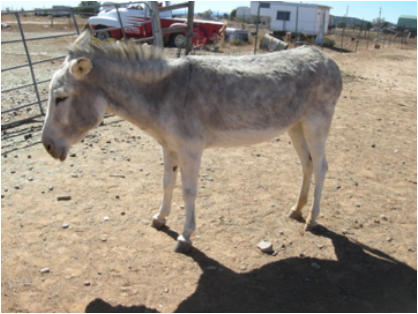 Chloe (formerly Christina) was a former cattle donkey from TX who entered our guard donkey adoption program in 2012 and was adopted out through us to a large cattle ranch in Quemado. Since the ranch is downsizing its cattle and donkey herd, Chloe was sent on to us together with two other cattle donkeys in January 2014. Since then she has been in foster care on the Turquoise Trail and learned to develop more of her personality as well as to trust people more. When her previously best buddy Zoe, who was a little dominant with her, was scheduled to be adopted as companion to a young jenny in Madrid, NM, Chloe hopped into the trailer instead. Since the adopter was fine with taking Chloe instead of Zoe, and no one else had yet offered her a home yet, Chloe left her foster home on March 29, 2014, to make a lonely young jenny in Madrid very happy. She will continue her training at her new home under our guidance. Abby and Miracle were two young jennies from Texas who arrived here at different dates both together with their mothers. 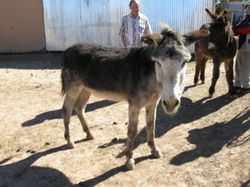 Abby came in June 2012, after being rejected as a cattle donkey in Quemado, NM, and Miracle at the end of February 2013. Their mothers were rehomed separately. Abby was in foster care for c. 6 months and then returned to our facility where she first met Miracle. When Miracle's mother's left in June 2013 the two girls started bonding. They became inseparable and eventually found a very nice home together just south of Santa Fe. There they have a job guarding the chicken coop that is placed right in their pasture so coyotes won't dare to come near the chickens. They will also teach the little boy of the family how to take care of large animals. Abby and Miracle went to their forever home on March 22, 2014. Update: Miracle sadly died of colic in June of the same year, leaving everyone behind missing her. She was such a sweet girl! Abby has a gelding as companion now. Mellie and Hocket (formerly Maggie and Maud) were two of the 17 Navajo burros surrendered to us on April 11, 2013, by a contractor of the Navajo Nation. They stayed at a foster/boarding location until September 2013, when they finally came back to us among the last ones of that herd to get ready to find a good home. They were picked by a very nice lady near Silver City and eventually adopted. They left us for their new home on January 8, 2014. We enjoyed our time with them here very much! Lily was another Navajo jenny rescued on April 11, 2013. She spent the spring and summer at a Largo Canyon foster home and returned to us with the last group of that herd on September 30, 2013. On arrival we discovered that she was in advanced stage of pregnancy. Lily was adopted by Trudy's and Tanya's family and left us on November 3, 2013. She gave birth to a little jack foal named Danny on December 5, 2013. However, Lily and her herd may be coming back to us in summer 2014 due to career moves. Trudy was another one of the Navajo donkeys rescued on April 11, 2013. She spent the spring and part of the summer at a Largo Canyon foster home. She was one of the first of this herd to return to us on June 9, 2013, due to her pregnancy. She gave birth to Tanya, a little jenny foal on September 28, 2013. Tanya is growing very fast. The two of them left us for their forever home near our facility on October 19, 2013. They were joined by Lily only 2 weeks later. However, the herd may be returning to us in summer 2014 due to career moves. 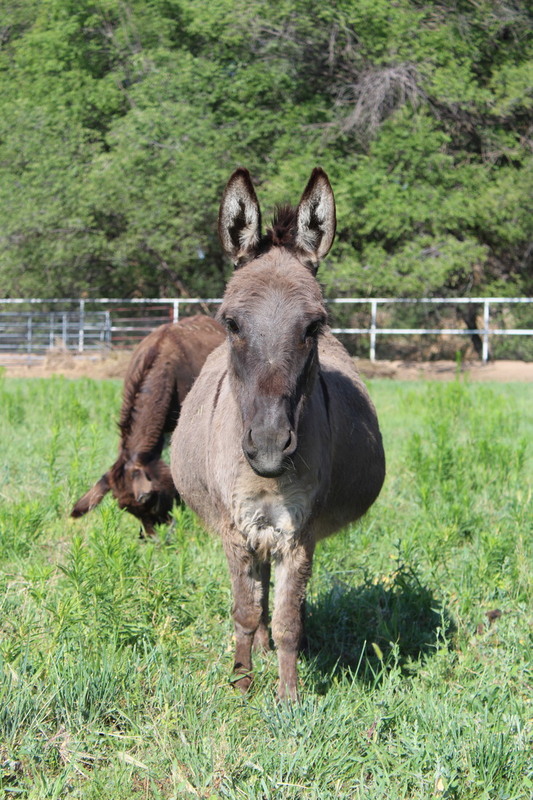 Hazel (formerly Coco) was yet another one of the Navajo donkeys rescued on April 11, 2013. She spent the spring and summer at a Largo Canyon foster home where she also received her basic ground training. She came back to us with the last group of that herd on September 30. After receiving some more training here, she went to a loving adoptive home not far from us on October 12, 2013. There she joined a herd of three mini mares and one mini donkey gelding. Hotay, a gelding born on June 19, 2008, at a good home was surrendered to us by his owner who could no longer keep him. He came to us on August 11, 2013, together with his mother Missy and stepfather Cocomo, both of whom found a nice foster home together elsewhere. Hotay was adopted and left us on October 10, 2013, to a wonderful home in Colorado, where he is learning to pack. Later on he will be also shown how to safely carry his adopters' grandchildren. 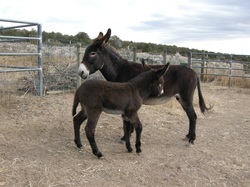 Pia and Konji (formerly Astrid) were two yearling Navajo jenny foals rescued together with their herd of 15 other Navajo donkeys on April 11, 2013, after the whole herd had been rejected at the sale barn in Los Lunas. Prior to that they had been culled from the Navajo reservation in the hopes they could be sold for their meat. 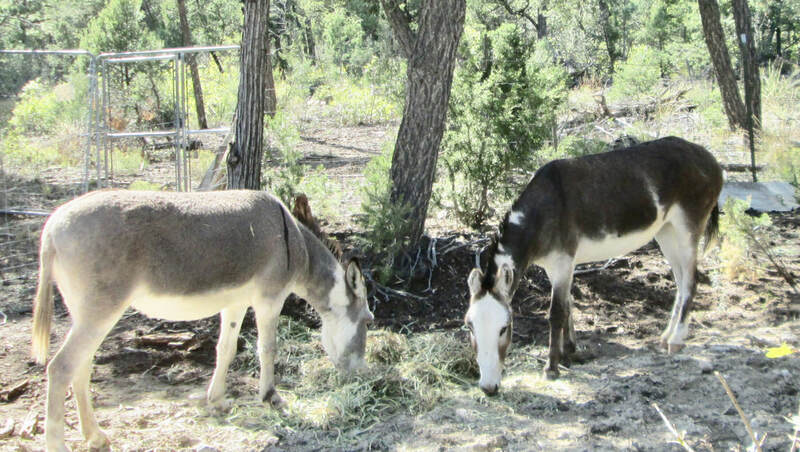 After they were rejected they found their way to The Longears Safehouse, which arranged for a foster home in Largo Canyon for the 16 wild donkeys of the herd. The herd was later transferred back to TLS in small groups. Pia and Astrid arrived here with three other foals on July 9, 2013 They received some training and TLC here until they found a forever home together near Laguna, NM, were they were adopted out on October 2, 2013. They now live with a nice family with three little boys, four lambs and a bunch of free-range chickens. Lila and Velma (formerly Laila and Velvet) were another 2 yearling Navajo donkeys and members of the herd that we rescued in April 2013. They had been dropped off at the sale barn to be sold at auction, but they were rejected and had no place to go. All but one of the 17 were fostered at a place in Largo Canyon for several months and then transferred to our facility in small groups. They arrived here with three other foals on July 9, 2013, and were adopted out to a great home south of Santa Fe on August 3, 2013. Solstice was a rescue donkey from TX who came here on February 28, 2013, to find a new home. She was a very sweet jenny and loved people; despite that she did not manage to find an adoptive home here, and so we sent her on to Lost and Found Horse Rescue Foundation in Maryland together with 12 other TLS donkeys on June 19, 2013. That rescue was short of donkeys at the time, since there aren't that many on the east coast. We wish Solstice all the best in her future life. 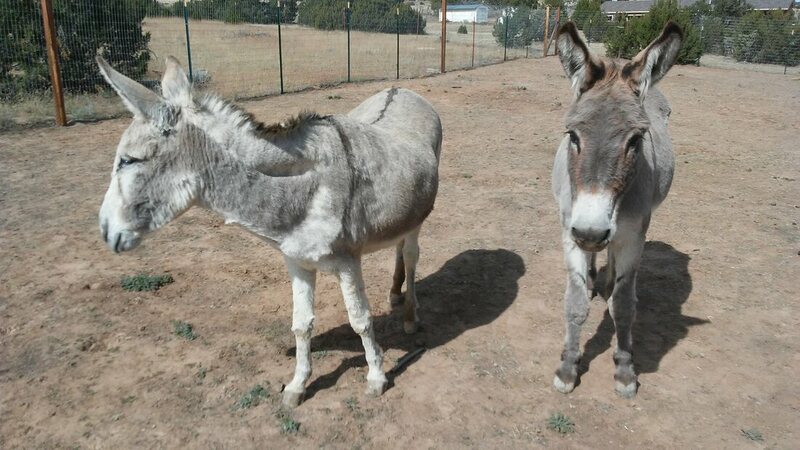 Pelle (left) was a rescue donkey from TX who was first adopted out through us as a cattle donkey in Quemado, NM. However, she did not seem interested in the job and appeared lethargic, so she was sent on to our facility in December 2012. At that point we noticed that she had teeth problems and urgently needed a dental float. She was treated twice for her teeth issues and will need an annual dental float for the rest of her life due to some chipped teeth in the back of her mouth. What we didn't notice at first was that she was pregnant. She did get a big belly after a while and bagged up. Despite very careful treatment and good food she lost her foal prematurely in February 2013. She recovered from this and eventually started making some friends in the herd. Pelle went with her familiar herd of 12 TLS donkeys to Lost and Found Horse Rescue Foundation in Maryland on June 19, 2013. We wish her all the best for her future. Rubio was a lovely little jack when we rescued him from Southwest Livestock Auction in Los Lunas, NM, on November 8, 2011. At TLS he got gelded and learned the basics of domestic donkey life. He was adopted out to what we thought was a forever home in January 2013, but it didn't last long. Rubio left us on June 19, 2013, to go to Lost and Found Horse Rescue in Maryland, together with 12 other TLS donkeys. He will enjoy the large pastures and green grass on the east coast. We hope that he'll find a lot of love too. Stella was a lovely jenny rescued from Southwest Livestock Auction in Los Lunas, NM, on November 8, 2011. She was pregnant and gave birth to a lovely white jenny foal named Storm at her first adopters' home in Corrales on November 7, 2012. The donkeys were eventually returned due to health issues in the family. Storm later found an adoptive home close to our place in Edgewood; she was renamed Matilda. Since no home was opening up for Stella here in NM we sent her on together with 12 other donkeys on June 19, 2013, to go to Lost and Found Horse Rescue Foundation in Maryland. She will either stay there for good or find a new adoptive home on the east coast. We miss her, but we know she wanted to be with her herd. She will love the green grass in Maryland. Miles (aka Thunder) was a tall, young gelding that we rescued together with 20 other donkeys from Southwest Livestock Auction in Los Lunas, NM, on November 8, 2013. After being gentled and receiving basic training he was adopted out to what we thought would be a forever home in December 2012. However, it did not last very long, and Miles came back to us together with his buddies Rubio, Daisy and Pearl in June 2013. 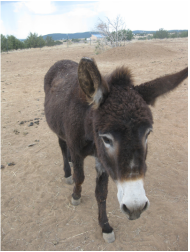 He left us together with 12 other TLS donkeys on June 19, 2013, to go to Lost and Found Horse Rescue in Maryland. We hope he is very happy there. Victor was a gelding who was surrendered to TLS by a contractor of the Navajo Nation on April 11, 2013, together with a herd of 16 feral donkeys from Navajo lands. Victor seemed more domesticated than the others, though. At TLS Victor learned to accept a halter, stand tied and lead a little. He is remembered for a very sweet personality and a slight preference for other geldings over jennies, although that changed when he met Stella. Victor left us together with 12 other TLS donkeys on June 19, 2013, to go to Lost and Found Horse Rescue Foundation in Maryland. We wish him all the best for his future. Jon and Susanna were two very lovely young siblings from Pecos, NM, whose owner surrendered them to TLS on June 4, 2013. They used to be guard donkeys and had just learned to accept a halter. If we hadn't had already five personal donkeys of our own we would have kept them. They both had very unique personalities. 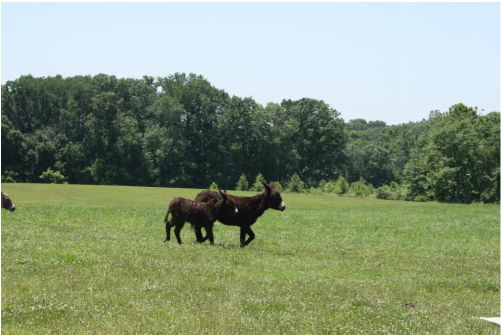 The two left us on June 19, 2013, together with 11 other TLS donkeys to go to Lost and Found Horse Rescue Foundation in Maryland. We wish them all the best for their future. Meringue (formerly Mama) and Chocolate were two very closely bonded jennies from TX who arrived here on February 28 to go to a new home in Colorado that had been arranged for them. They were supposed to become sheep guardians. However, Chocolate got an abscess at the last minute, and we had to send two other donkeys instead. Chocolate and Meringue learned to become more comfortable with people and halters and left us together with 11 other TLS donkeys on June 19, 2013, to go to Lost and Found Horse Rescue in Maryland. We wish them all the best in their future life. 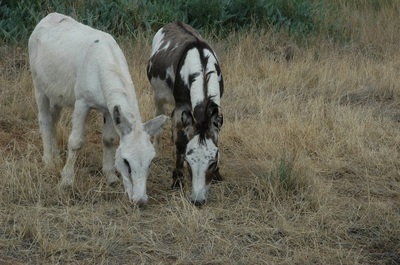 Mona and Lisa were feral donkeys from a large cattle ranch who wandered over onto BLM land and were captured, together with Bilbo, who was apparently Lisa's father. They were surrendered to TLS by BLM employees on June 3, 2013. They were very sweet donkeys. 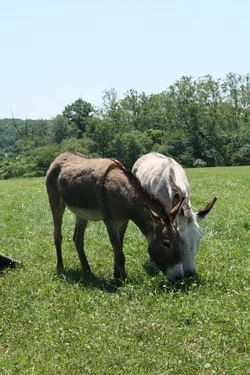 Since Mona and Bilbo were not as close as one would have wished, we sent Mona and Lisa on to Lost and Found Horse Rescue Foundation in Maryland together with 11 other donkeys on June 19, 2013. We wish them the best in their future life! 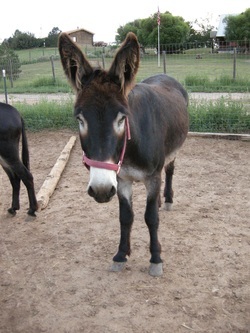 Mary was surrendered to a TX rescue by a backyard breeder together with a number of other donkeys. She was sent to us together with her yearling daughter Miracle and some of the others on February 28, 2013, to find a new forever home. She left us together with 12 other TLS donkeys on June 19, 2013, to go to Lost and Found Horse Rescue Foundation in Maryland. There she gave birth to her new jenny foal on September 21, 2013. 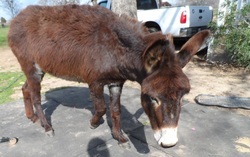 Debbie was a c. 10-year old jenny and rescue donkey from TX who arrived at TLS very pregnant on February 28, 2013. Almost to the day 2 months later she gave birth to a very cute jenny foal we named Luna Rose on April 25, 2013. 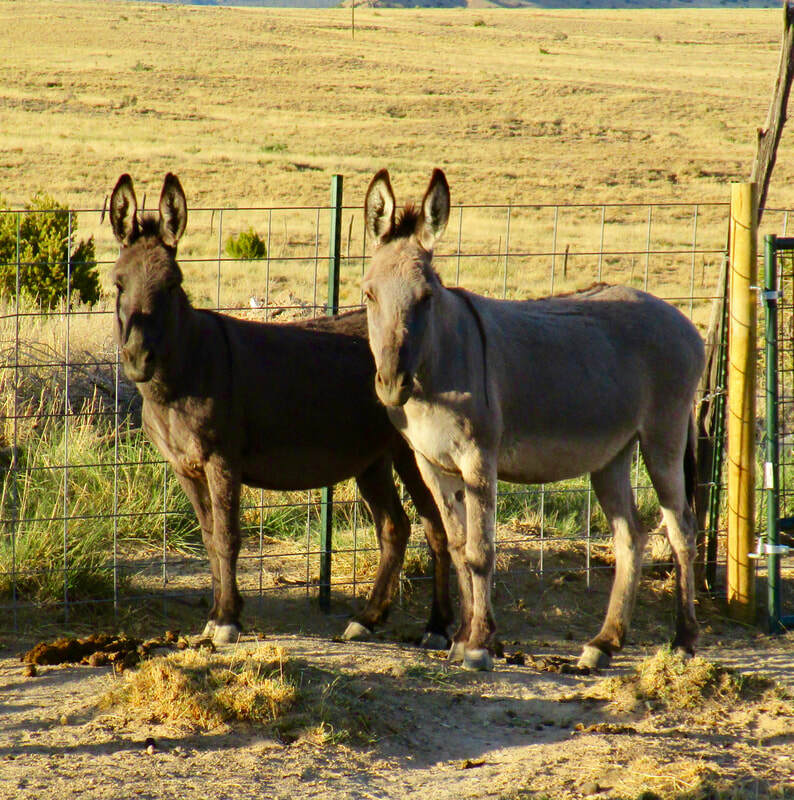 Debbie and Luna Rose were adopted out together to a great home in El Rito, NM (near Abiqui), to keep a lonely donkey gelding company. They left us on May 29, 2013. 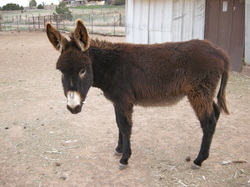 Matilda (formerly Storm) was born on November 7, 2012, at a home in Corrales. Her mom Stella and her dad, mammoth donkey Joaquin, were both rescued by TLS on November 8, 2011, almost exactly a year earlier, from Southwest Livestock Auction in Los Lunas, NM. 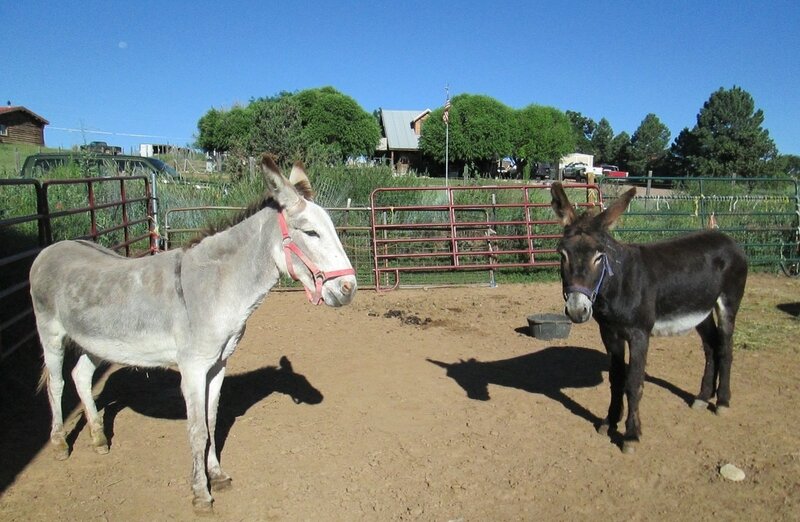 Stella had been adopted out in Corrales when Matilda was born, but the two of them were returned in December 2012. Matilda herself has never known hardship, neglect or abuse, and we will continue to make every effort, now and in the future, to ensure that she will never experience it. Matilda left us on May 7, 2013, to a loving home in Edgewood. Update: When her adopter fell ill in early 2018 without knowing quite when or if he would recover, she was rehomed to a new adoptive situation in Belen, where she bonded with a new donkey friend. Bridget (left) was a jenny purchased for a decent amount of money by TLS volunteer Chris for his MFA graduation project, which involved walking and living with his donkey on campus for 4 days. She was boarded at TLS while Chris was preparing for his project. Bridget (then named Fairuz) was not sympathetic to campus life but she took many other walks with Chris on the roads near our facility. She was signed over to TLS and adopted out together with her best friend Claudette on April 21, 2013. 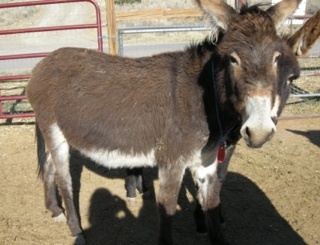 Claudette was rescued together with 20 other donkeys on November 8, 2011, from Southwest Livestock Auction in Los Lunas. She was one of many pregnant jennies in the group. It is hard to predict what would have happened to her had she not been rescued, but it is pretty clear that her chances of a good, long life were extremely slim. 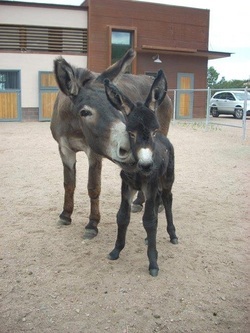 During her time at TLS she gave birth to a young jack foal named Isaac, was briefly adopted out together with him to a nearby home but returned to TLS when Isaac was ready to be weaned. Bridget and Claudette left us or their new forever home on May 2, 2013, and have been happy ever since. Josey (front) and Raggy were two young geldings (both around 3 yrs old) who met at our facility and became best burro buddies. Josey came to us on December 23, 2012, as an owner surrender from a friend who needed to reduce her herd. Raggy came to us together with 12 other donkeys on February 28, 2013, from a rescue in TX that needed to close down for health reasons. Though they each had other friends at first, they soon found out how great it was to play and hang out together. At TLS both learned how to lead better, and on April 2, 2013, the day they left us, we simply took a long 2-hour hike with them to their new home. Raggy and Josey will have a grand life together. The last we heard they were in the middle of their driving training, and their adopters were getting close to hooking them up to a cart. Pancho (formerly Grouchy) was a mini donkey gelding sent to us in December 2012 from a rescue in Texas, where he had been taken in as an abandonment case. He was still very skeptical about human contact while here but proved to be a magician with other donkeys and, despite his tiny size, was taken seriously by everyone in the paddocks. 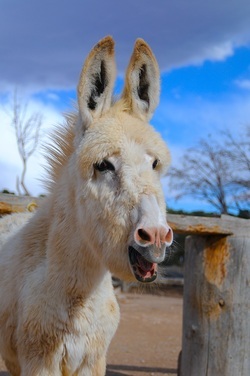 Grouchy left us on March 7, 2013, to join his old Texas friends Rhett and Athena at a wonderful donkey home in Deming, NM. Update: Sadly, Pancho's adopter died in the fall of 2017, and he then was rehomed to a new adoptive situation. However, he, too, was subsequently found deceased in his field not long after moving to his new home. Rest in peace, little fellow! 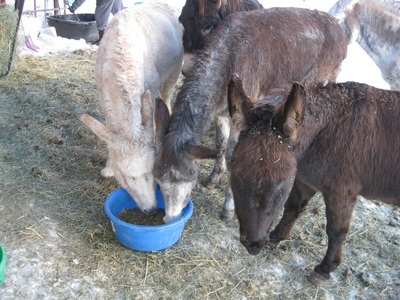 Maia, Nocturne, Cleo and Leo were rescue donkeys rom TX who came here on February 28, 2013. We found an adoptive home and job for them at an organic sheep ranch in Southern Colorado, and they left us together for their new home on March 7, 2013. Never will they be homeless again. 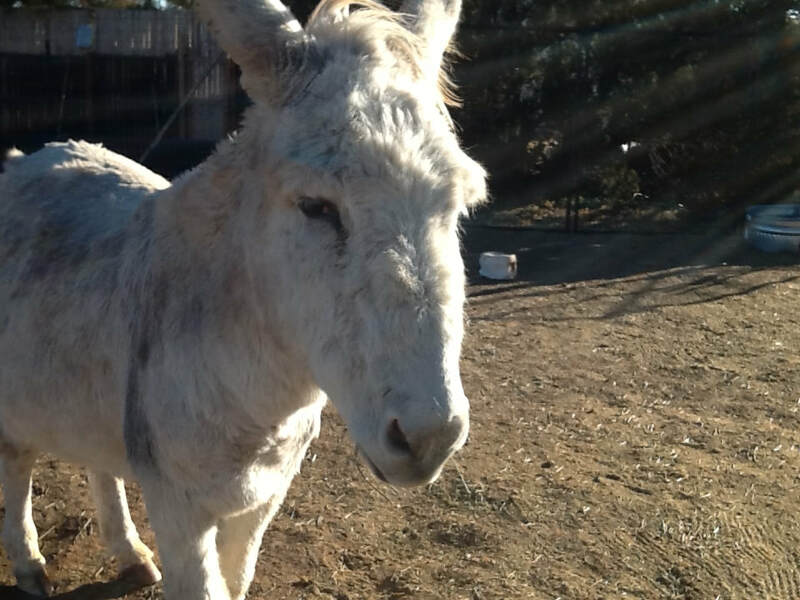 Katrina was a 2-year-old former roping donkey who was offered for free on Craigslist. She came to us on May 26, 2012, and was adopted out for the first time on August 3 to a home in Corrales together with Stella, another of our donkeys. 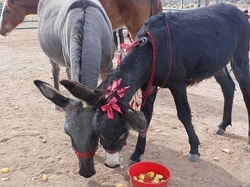 However, her first adoptive family returned the donkeys to us on December 23, 2012, due to health reasons. Fortunately, we already knew of a new home for which Katrina would be a perfect match, and so she left us again on December 24, 2012 to a home just south of Santa Fe, NM. Update 2/15/2014: Once again due to health issues the new home proved to be of limited time for Katrina. 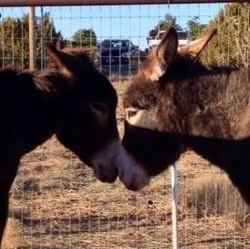 However, she bonded closely with another jenny there, and the two of them moved to Longhopes Donkey Shelter in Colorado on 2/15/2014 with our permission to continue their exciting life together. We hope that from there they'll find another great home together that will last a long time! The picture shows Katrina (right) with her best friend ZeeZee. Katrina and ZeeZee are now up for adoption together at Longhopes Donkey Shelter in Colorado. Athena and Rhett were two rescue donkeys from Texas who came to us on December 9, 2012, from a Texas rescue that has to close down. They had just recently bonded and were almost inseparable at our place. 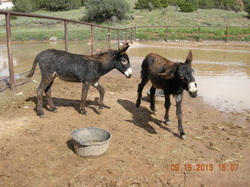 We managed to place them with our adopters in Deming, NM, where they joined Joaquin and Bonnie on December 22, 2012. We are very glad that they could stay together! Update: When their adopter sadly and unexpectedly died in the fall of 2017, Athena and Rhett were moved to a new adoptive situation not far from their old home. El Chivo (formerly Bubba) was an owner surrender who came to us on June 1, 2012, from a home in Edgewood. He had badly overgrown hooves, was quite scared at first and, as an intact jack locked up in a much too small pen alone for a long time, full of testosterone. He had been without the company of any other donkeys for 1 year prior to coming here. Both of these factors made it hard for him to resocialize himself with other donkeys. During his time here got gelded and his overgrown hooves were trimmed twice. He learned to share hay with up to three other donkeys and to live in a herd of male donkezs. However, in the end we decided to adopt him out as a horse companion rather than together with other donkeys. He had wounds and scars on his neck during most of his time here rom his quarrels with the other geldings. He now lives with a pretty white Arabian horse, also a gelding, at a very nice place near Santa Fe. He arrived there on a probationary basis on October 27, 2012, and was officially adopted on November 12, 2012. El Chivo and his horsey friend are very happy together. Molly (formerly Finity) was one of the many abandoned donkeys in Texas, but fortunate enough to be taken in by a county shelter together with her daughter Abby and to be selected by our partner rescue in Texas to enter our cattle donkey adoption program. Both were adopted out to a ranch in Quemado, NM, to guard the newborn calves there. However, they arrived with some kind of fungus at the base of their ears and thus were sent on to TLS to cure this condition and find another home from here. They arrived here on June 8, 2012 together with Walker Blue, another former cattle donkey who needed to change his line of profession and was adopted out soon thereafter. Since Abby seemed too dependent and oppressed by her mother, we decided to adopt them out separately. 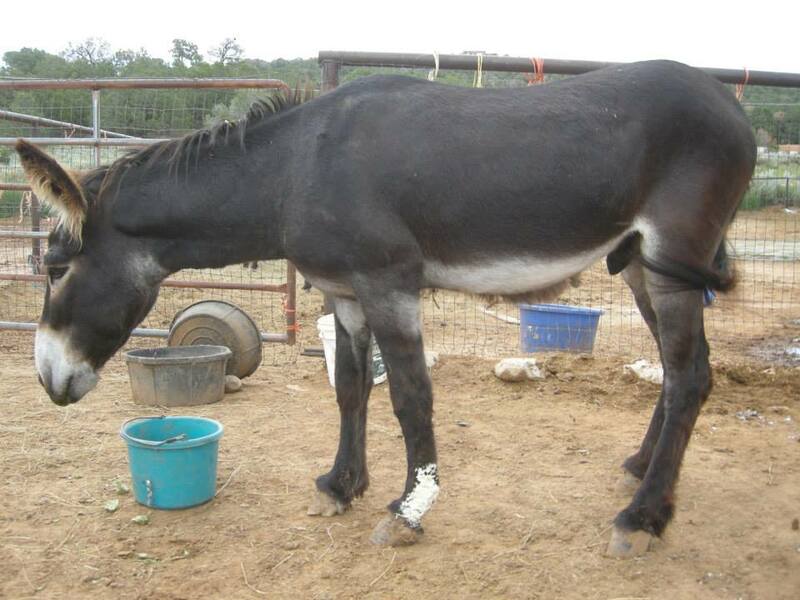 Molly found a great home as a companion to a lonely young donkey gelding on October 16, 2012. She'll be teaching him manners. Isaac was born to Claudette on June 19, 2012. He was adopted out to a home in Sandia Park, NM, on June 28, 2012, together with his mother Claudette. Claudette is a chocolate jennet rescue from Southwest Livestock Auction on November 8, 2011. Claudette and Isaac lived together at Isaac's new home until December 23, 2012, when Claudette was returned to us. Isaac was weaned and received some more serious training at his new home. Unfortunately, little Isaac eventually died on November 4, 2013, from a cancerous condition that affected his entire abdominal area. He was a beautiful, very sweet yearling, and he is dearly missed by everyone, especially his loving adopter. We will always remember him. Butch was a BLM sale authority jack whom we rescued together with three others (Doc, Wyatt and Sundance) on August 17, 2011, from a life of roping practice. He was very scared of humans at first and could not be handled for several months. He was the second of the four who eventually learned to trust and even to like humans. During his time at TLS he was gelded, got two hoof trims, vaccinations, worming, good food and some ground training. He left us on August 4, 2012, almost one year after his rescue. He now bides his time on green pastures in Taos, NM, as a companion to a previously lonely mammoth jenny who looks like his mother (or older sister?). Lefty and Nora were another match made in heaven. Both came here at different times and from completely different backgrounds, but they were picked to go to the same home together, and it was probably the best match imaginable, at least for Nora. Lefty was the youngest of the 21 donkeys that we rescued on November 8, 2011, from Southwest Livestock Auction in Los Lunas, NM. In fact he was so young that he was still with his mother, a pretty chocolate jenny whom we called "Claudette". Since he was still a jack we had to separate them, so he had to learn to live in a large male herd. The biggest guys in the herd protected him and showed him how to behave. He learned very quickly and developed into a popular, well-liked member of the herd. She was adopted out by the sanctuary and stayed at her new home for a month. However, due to her frequent braying her neighbors did not tolerate the arrangement. And so she came to us on May 9, 2012. At our facility she learned more about living with and accepting donkeys as her companions, even to flirt with donkey jacks and geldings. She also learned to do with less human attention and to keep herself busy by interacting with other donkeys and the occasional horse that would pass by with a rider on its back. Eventually she and Lefty were picked to go to a large ranch in Stanley, NM. Even though they have horses there, Nora apparently has decided to stick together with Lefty, whom she treats like her little brother and prefers over the company of the horses. Little Lefty managed to convince her that she is a donkey, after all! 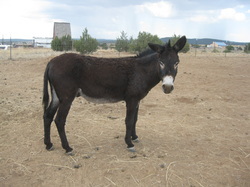 Esperanza (formerly Reese) was among the 21 burros rescued from Southwest Livestock Auction in Los Lunas, NM, on November 8, 2011. She is BLM branded and also carries the giant "U" identifying her as sale authority animal. Esperanza was closely bonded with Nina (formerly Shiloh), and both were pregnant. It took us a while to gentle them and get them used to basic handling. They left us on January 15, 2012, and moved on to Journey's End Ranch Animals Sanctuary in sunny Arizona. 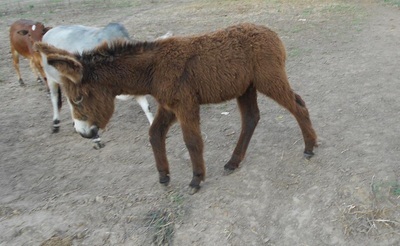 There Esperanza gave birth to a little jenny foal named "Florencia" on June 25, 2012. Nina eventually gave birth to a jack foal named "Julio" on November 28, 2012. They are a very happy herd over there. 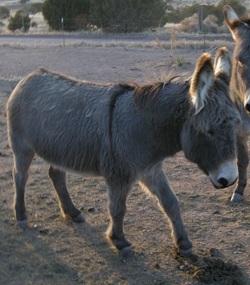 Winter (formerly Marylou) was among the 21 burros rescued from Southwest Livestock Auction in Los Lunas, NM, on November 8, 2011. She was one of the pregnant jennies rescued on that occasion. 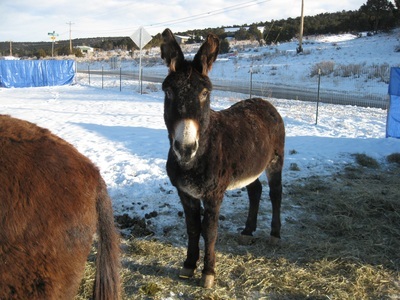 She was adopted by a very nice lady in Tesuque, NM, who has a big heart for rescued donkeys, and left us on January 19, 2012. On May 20, 2012 (on Mother's Day!) she gave birth to a healthy jenny foal named "Spring". 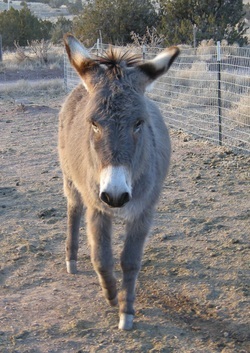 Luna Belle was among the 21 burros rescued from Southwest Livestock Auction in Los Lunas, NM, on November 8, 2011. She had the worst case of overgrown hooves that we have personally experienced so far. After 2 hoof trims and some halter training she found a loving home in central Arkansas, where she is now companion to a (formerly lonely) donkey gelding. She left us on January 10, 2012. 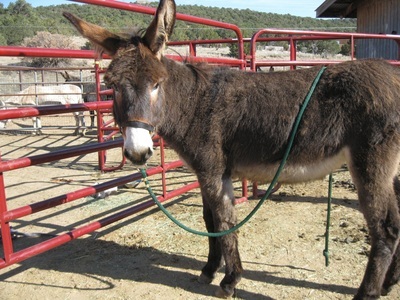 Doc was among the four BLM sale authority burros that we rescued from a home south of Albuquerque on August 19, 2011; they were offered on Craigslist for roping practice and had obviously been roped before. Like most of the donkeys we rescued, he had never worn a halter, never had his feet trimmed voluntarily and never had a positive experience of human touch. Despite being the oldest of the four, he was eventually the first of them to overcome his fears, so that we were able to send him to a warmer climate just when the winter was starting to get really bad here in the mountains. He went to his retirement home at a sanctuary in east Texas on December 17, 2011 - almost 5 months after his rescue - together with three jennies he adored: Moonbeam, Rose and Nellie Jean, who had been rescued on our first mission from the Los Lunas sale barn on July 19, 2011. Moonbeam was rescued with a severe case of strangles, pregnant and with horribly overgrown hooves. She gave birth to a jenny foal the night after her rescue, but the foal could not nurse and did not respond well enough to bottle feeding either. She was adopted out to a loving home that had some experience with raising newborn foals by bottle but did not survive beyond the second day of her life. Her name was Sunrise. Moonbeam recovered and became a healthy donkey with good hooves. Rose was the most fearful of the three jennies and most likely had been roped as well in her former life. She also suffered from severe hoof neglect. She learned to trust enough that she could be haltered for emergencies and took treats from our hands, but she never fully overcame her trust issues until the date of her departure here. Finally, Nellie Jean had crooked, once broken hind legs, probably from roping as well, and severe trust issues with regard to halters, leads and any other kinds of ropes. She was a sweet girl, though, who loved to be cuddled. We hope very much that these four sweeties continue to enjoy a comfortable life and positive human interaction for the rest of their lives. 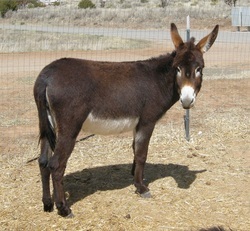 Festus was one of the 21 donkeys rescued from Southwest Livestock Auction on November 8, 2011. 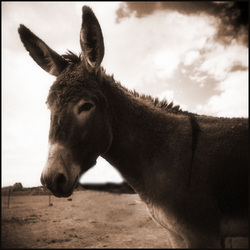 He was one of three mammoth donkeys that somehow made their fateful way to the Los Lunas feedlot. His future adoptive mom fell in love with him from a photo taken of him when he was still at the feedlot of Southwest Livestock Auction. Festus was some kind of alpha jack of our rescue herd at the time and, despite his age and slightly beaten up looks, probably the most energetic of them all, always ready for a good play and brotherly fight, but never really out to harm anyone. Festus did not have to stay with us for long; after a couple of weeks in quarantine his adoptive dad picked him up to take him to his new forever home in Silver City, NM. 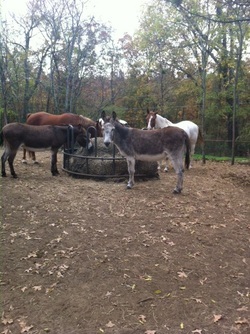 Festus now shares the barn with three gelding donkeys, including one other mammoth. He ia now a gelding himself. Festus is quite a character and was dearly missed by his herd companions. After he left both the jennies and his bros in the pasture let out loud brays of goodbye. Pancho (formerly Melvin) was the first graduate of the herd of 21 rescued from Southwest Livestock Auction on November 8, 2011. He was very friendly and people-oriented, a sign that he once lived at a good place where people cared about him. Even his hooves were in relatively good shape. We were very happy that someone fell in love with him so soon after his rescue and that he is loved for his personality, not merely his (impressive!) size or usefulness for this or that task. 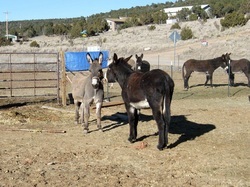 Pancho left us for his new forever home in Fence Lake, NM, on November 20, 2011. He is doted on and enjoys regular massages with a curry comb. This group of six gorgeous donkeys was among the eleven we rescued on our very first mission from the Los Lunas sale barn. They all went to a great home in Nevada. Compared to the others of that group, these ones were in fairly good shape when we found them, but they needed rescue too, since few donkeys at the sale barn have a chance of finding a good home. We are very glad to have provided them with a safe and comfortable future. We took in Buck on July 19, 2011 along with ten other donkeys who were found in the "kill pen" at the Southwest Livestock Auction. This was our first rescue mission. Most or all of these donkeys had been abused and/or severely neglected. To varying degrees they all needed to be worked with before allowing themselves to be touched, haltered, handled by the vet and farrier, and so on. As private people we took them in because no official rescue or other private home was available to them. At first, Buck was one of the most difficult cases in this group. He was very skittish and evasive, and coming to allow humans to touch or even approach him was a difficult task for him. Besides that, he had a crippled hock and badly deformed front hooves, both probably from a severe accident some time when he was quite young, that made it dangerous for him to run and play. Being still a young jack, he also needed gelding. In time we managed to ease him over his fears, get his hooves professionally corrected, halter-train him, and have him gelded. Once those fears were gone, he turned out to be one of the most loving, affectionate, and affection-loving donkeys we've ever known. And then, finally, the perfect home opened up for him. 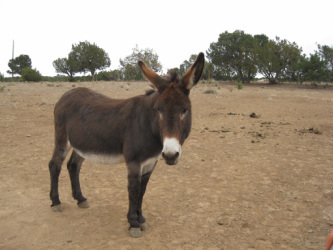 On October 23, 2011, he headed off to his forever home, which he shares with six other donkeys and, of course, his human parents. He loves all his new friends, and they love him back. In December 2013 he moved with his family to Virginia. Grace (left) was a pregnant jenny rescued together with another pregnant jenny and a gelding from Southwest Livestock Auction in Los Lunas, NM, on October 16, 2011. This was our third rescue mission. Grace was in an advanced stage of pregnancy, and her foal would not have survived had it been born there. Grace stayed at a foster home in Bernardo, NM, only for a couple of days before being picked up by her new human mom and taken home to Equine Spirit Sanctuary in Ranchos de Taos. There she gave birth to little Joy on October 25, 2011. In the meantime Grace and Joy have become quite famous in the world of paintings as well as on Facebook. And as you can see, Joy is now a grown up, very pretty young lady!